Union Finance Minister Piyush Goyal presented the interim budget for 2019 on Friday. There was a lot in it for taxpayers, especially those in the low and middle income groups. 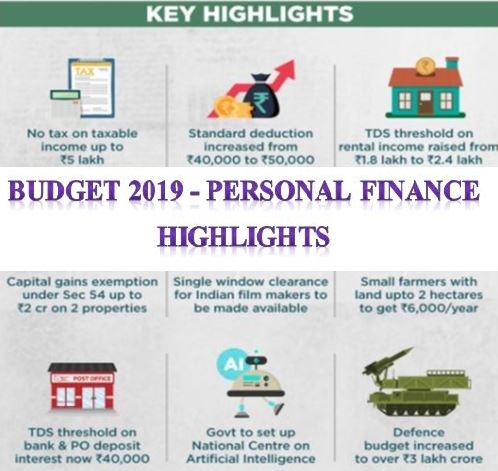 Here is a look at the most important announcement made in Budget 2019 with regards to personal taxation and its impact. Individual taxpayers having taxable annual income up to Rs 5 lakh will get full tax rebate, therefore, will not be required to pay any income tax. People with gross taxable income up to Rs 6.5 lakh will have to pay no tax if they utilise the maximum benefit of Rs 1.5 lakh available under section 80C. Standard Deduction increased from Rs 40,000 to Rs 50,000. Standard deduction was introduced last year for salaried employees. Depending upon your marginal tax rate, this will provide some relief for salaried employees. Please understand the benefit through Standard deduction is applicable to only to salaried employees or pensioners. So, if you are self-employed, this is inconsequential for you. To benefit small depositors and non-working spouses, TDS threshold limit has been proposed to be hiked to Rs 40,000 from the current of Rs 10,000. Additionally, TDS threshold limit has been proposed to be hiked to Rs 2.4 lakh in a financial year from the current Rs 1.8 lakh for small taxpayers who have given property on rent to non-individuals. . This rule is not applicable to individuals or HUFs. You have sold a residential property and have some capital gains from such sale. Till now, one of the ways to save capital gains tax on such a sale was to construct or purchase one new residential property in India. This is under Section 54 of the Income Tax Act. Now, you can purchase or construct two properties to save on capital gains tax. There are a couple of conditions to be met. The said long term capital gains shall not exceed Rs 2 crores. Moreover, you can avail this relief just once (two properties instead of one) in your lifetime. Government contribution to NPS accounts of central Government employees increased from 10% of salary (Basic + DA) to 14% of salary. This had been notified earlier. Surprisingly, the budget didn’t make mention of the NPS lumpsum withdrawals up to 60% of the accumulated corpus exempt from income tax. Perhaps, this was because this is an interim budget. This scheme is for workers in the unorganized sectorearning up to Rs 15,000 per month. Participants will get guaranteed monthly pension of Rs 3,000 per month from the age of 60 till death. Your contribution will depend on age. As per Finance Minister, a person aged 29 will have to invest Rs 100 per month. A person aged 18 will have to invest Rs 55 per month. The Government will make a matching contribution. Personally, I do not see much need for this scheme. Atal Pension Yojana has been quite successful.